India has become a battleground over the right to unrestricted Internet access, with local tech start-ups joining the front line against Facebook Inc founder Mark Zuckerberg and his plan to roll out free Internet to the country’s masses. The Indian government has ordered Facebook’s Free Basics plan to be put on hold while it decides what to do. The program, launched in around three dozen developing countries, offers pared-down web services on mobile phones, along with access to Facebook’s own social network and messaging services, without charge. But critics say the program, launched 10 months ago in India in collaboration with operator Reliance Communications, violates principles of net neutrality, the concept that all websites on the internet are treated equally. It would put small content providers and start-ups that don’t participate in it at a disadvantage, they say. “India is a test case for a company like Facebook and what happens here will affect the roll out of this service in other smaller countries where perhaps there is not so much awareness at present,” said Mishi Choudhary, a New York-based lawyer who works on technology and Internet advocacy issues. Also at stake is Facebook’s ambition to expand in its largest market outside the United States. Only 252 million of India’s 1.3 billion people have Internet access, making it a growth market for firms including Google and Facebook. The Telecom Regulatory Authority of India (TRAI) said on Thursday it had received record submissions for a public consultation that precedes the rule-making process. But more than three quarters of the 1.8 million comments submitted by users via Facebook will be disregarded as they did not follow the proper format, TRAI Chairman Ram Sevak Sharma told a news conference. In the past week, Facebook has urged users in India to send a response to the TRAI both through its social networking platform and through mobiles by dialling a number that automatically generates a response on the users’ behalf. However, the social media giant faces stiff resistance. In a letter seen by Reuters, the heads of nine start-ups including Alibaba-backed Paytm and dining app Zomato have written to the TRAI urging it to ensure Internet access was allowed without differential pricing. “There is no reason to create a digital divide by offering a walled garden of limited services in the name of providing access to the poor,” they wrote. Zuckerberg has got personally involved. “We know that for every 10 people connected to the Internet, roughly one is lifted out of poverty,” he wrote in The Times of India newspaper this week. “We know that for India to make progress, more than 1 billion people need to be connected to the Internet. A Facebook spokesman said the aim of the Free Basics initiative was to give people a taste of what the internet can offer. And Facebook has issued a series of full-page newspaper advertisements and billboard banners in an aggressive campaign to counter the protests. 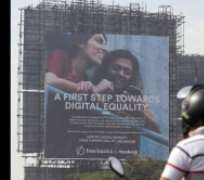 “Free Basics is at risk of being banned, slowing progress towards digital equality in India,” said an advertisement published in Mumbai newspapers on Wednesday, urging Internet users to support the initiative. Launched last year in Zambia, Free Basics, earlier known as internet.org, has run in to trouble elsewhere on grounds that it infringes the principle of net neutrality. Authorities in Egypt effectively suspended the service when a required permit was not renewed after it lapsed on Wednesday. The TRAI has asked Facebook and Reliance Communications to suspend Free Basics until a final policy decision is made next month. “In a democracy you have both sides – you have Facebook spending so much on the campaign and on the other side you have internet activists making their own efforts,” the TRAI’s Sharma told Reuters on Wednesday.